Options in India: Right place at the right time! 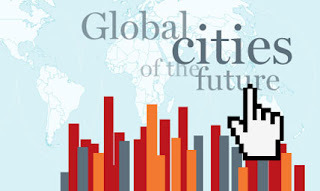 Great time to review : Is our future linked to the places where the action is likely to be? In March 2011 McKinsey Quarterly published this report on the Global Cities of the future. Please click for the extremely educative & interesting interactive link here to be in sync of perhaps how the World will look like -in a little over a dozen years from now!! Middleweight companies in Emerging Markets are poised to deliver more growth than the entire developed world and the mega cities in the Emerging markets combined!! ie 400 cities like Casablanca, Chengdu, Nagpur, Sharjah, Vadodara, & Visakhapatnam, among others are likely to contribute to the 40% of the global growth in the next 15yrs. Things worth mulling over..atleast for the future of our children?